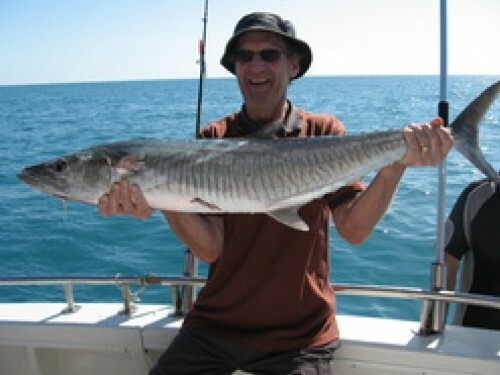 This popular 5 hour offshore fishing charter Darwin departs 3 times per day from Cullen Bay. The last departure at 4:30 is our very popular night fish, get a brilliant sunset while the fish are biting. Our vessels cruise at 18knts getting you to the fishing grounds faster, therefore extending your fishing time. You’ll fish around tropical reefs teeming with marine life. Travel up to 17 miles from Darwin. You’ll target fish species such as Snapper, Black Jewfish, Queenfish, Trevally, Spanish Mackerel, and other mixed reef fish. Enjoy a delicious sausage sizzle for the afternoon and night trips and a bacon and egg sandwich for the mornings with the catch of the day cooked up. Our Darwin fishing trip will give you the best fishing experience along with luxury travel. Our Professional and experienced crew are on hand to assist you with baiting your hook and cleaning your fish ready to take home. Your sure to enjoy a thrilling time fishing on board the comfortable, stable vessels equipped with toilets, shaded canopy’s and large walk around deck space. Price: Adult $165.00, child $95: 12 & under. Return Time: 5 hours from start. Inclusions: Quality Rods & Reels, Bait & Ice Tea/Coffee BBQ lunch Sausage sizzle, iced Water Iced Eskys for BYO Alcohol & Soft drink. Darwin Reef ‘N’ Wrecks are a family owned Darwin fishing charter business, located in the top end of Australia. If you are looking for the ultimate Darwin fishing trips, we can give you exactly what you want. On our Top End fishing charters, you can experience Barramundi fishing, offshore fishing or reef fishing. Fish the Shoals of the Timor Boxes on our live aboard 65 ft conquest, get a group of mates together for the trip of a life time, with Darwin Reef ‘N’ Wrecks fishing charters. We have many years of fishing experience in the tropical waters of the Northern Territory coastline. We offer 5 day Mothership to remote rivers fishing for barramundi. 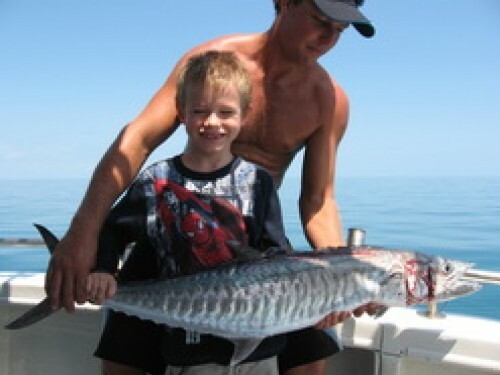 Our speciality is giving you the ultimate fishing charter in the magnificent tropical Top End waters of Australia.